Once a week, Ashton Pino takes her two dogs, Mirfy and Winston, to the Raising Cane’s Dog Park and then visits a local pet store where each pooch gets to pick out a chew toy or treat before heading home. If it means keeping her dogs happy and healthy, Pino is willing to splurge. The weekly trips to the pet store typically cost about $50, she says, but the big bucks are spent on feeding her dogs. Pino pays about $200 a month for a nutritious brand called Wellness for her two small dogs, who are both rescue mutts. 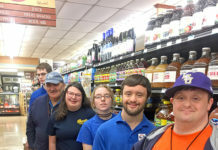 “These guys are on gluten-free, paleo-style diets,” she says, adding the healthier diets help reduce trips to the veterinarian, which can also drain the wallet. For check-ups and preventative shots, Pino spends about $400 every year on each dog. But for Pino—a 26-year-old banker in Baton Rouge whose husband, Jody, is a police officer—the companionship her pets provide is well worth the expense. “I don’t know what I’d do without them,” she says. humans—and in many cases even better—as owners are more willing to pamper pets with wholesome food, advanced vet care and specialty services. 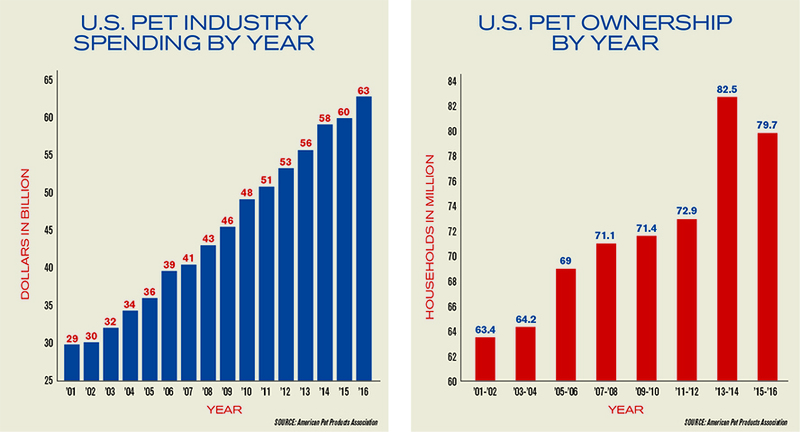 The American Pet Products Association estimates pet spending reached a record high $63 billion in 2016 across the U.S. That number has more than doubled since 2001. Last year, pet owners across the country spent the most on food, $23 billion, followed by vet care at $15 billion. Supplies and over-the-counter medicine spending totaled $14 billion, while pet grooming and boarding service sales reached $5 billion. 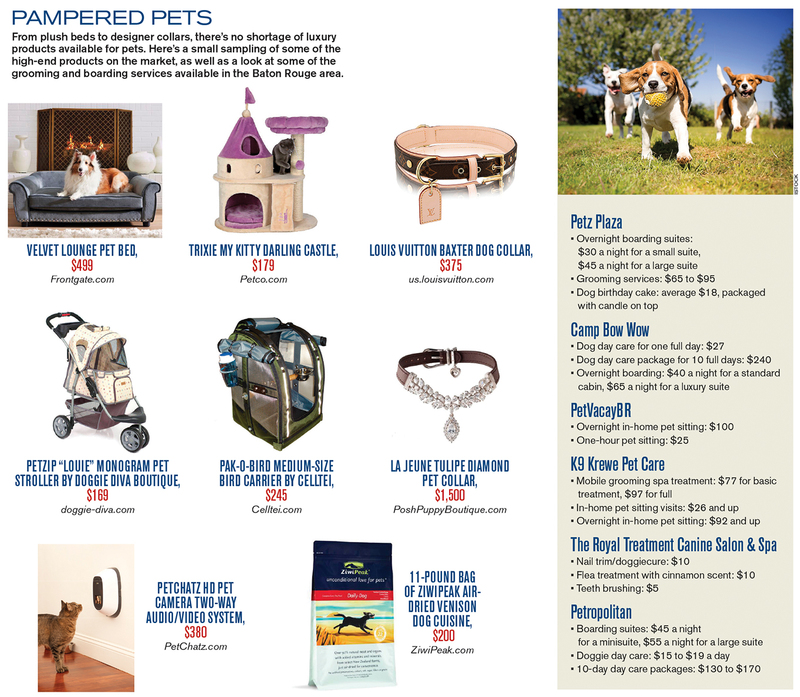 At the same time people are spending more on their pets, pet ownership is also on the rise. A 2015-2016 APPA survey found that 65% of U.S. households include at least one pet. That’s almost 80 million homes, which is up 9% since 1988. 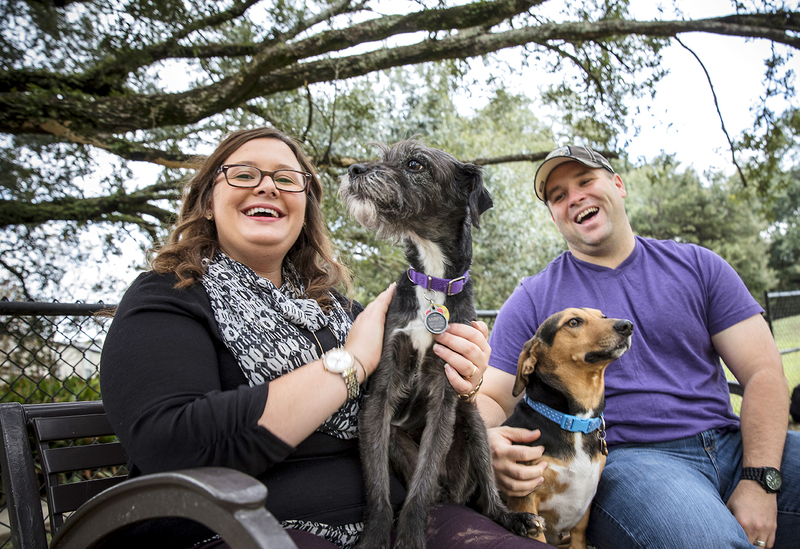 The phenomenon has spurred the growth of pet services, such as Camp Bow Wow in Baton Rouge. 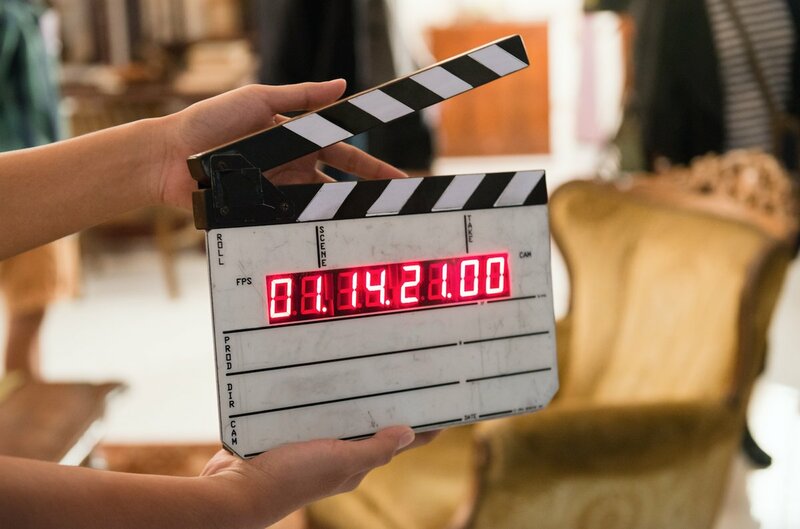 The dog boarding and daycare franchise opened in 2013, and a second location in Prairieville is already in the works and will open next year. Marketing manager Jennifer McInelly says Camp Bow Wow averaged 136 new “campers” each month between September 2015 and September 2016. People are also traveling now more than ever, she says, and they want a safe place for their four-legged friends to stay while they’re away. As owners take better care of pets, they’re spending more at the vet as animal care grows more advanced, mirroring human health care trends. And in the digital information age, pet owners better understand why treatments are necessary. 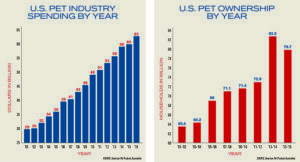 A look at U.S. pet ownership and spending through the years (Click to enlarge). Jensen decided to take her practice on the road after noticing rising demand for traveling vets who could treat a variety of animals in the home. Her decision proved worthwhile. 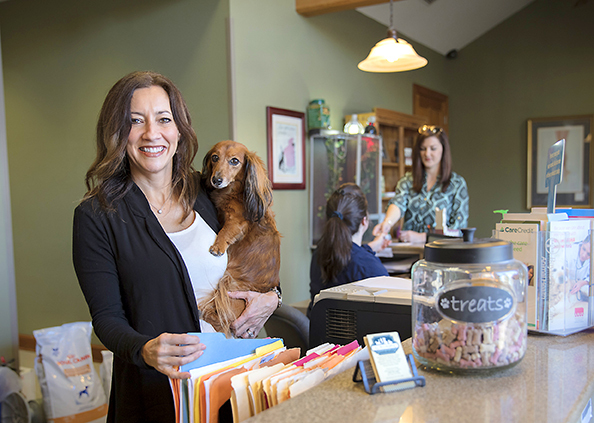 In the four months since launching MJ’s Veterinary Services her clients have tripled. Jensen treats large and small animals with routine vaccines, general checkups and exams, and she can do X-rays, ultrasounds and blood work on site. For surgical procedures beyond her mobile capacity, Jensen refers patients to clinics. She also uses an online pharmacy to order medications she doesn’t have on hand. Jill Thaller, practice manager at All Pets Hospital on Perkins Road, says vet care has come a long way in recent years. Pets of previous generations didn’t have as many health care options because technology and science weren’t there yet. But now, Thaller says, the sky’s the limit for treating pets. 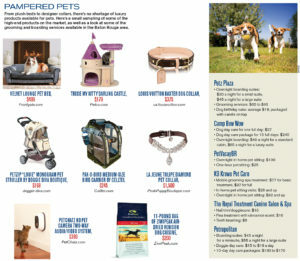 A look at some of the high-end products and services on the market for pets (Click to enlarge). 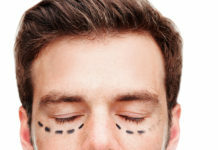 Keeping up with new technologies and treatments isn’t easy, especially for the smaller clinics that make up the majority of the local market. They depend on clients to pay directly for treatments—which are often expensive—without pet insurance, which many owners do not have, Thaller says. It’s common for vets to run their own clinics, but it’s getting more difficult as the industry becomes more advanced and costly. Jensen and Thaller are both advocates for pet insurance, which is one of the fastest growing voluntary employee benefits, according to Consumer Reports. Nationwide, formerly Veterinary Pet Insurance, is the largest provider of pet health insurance in the nation, with more than 575,000 insured pets, says spokesman Adam Fell. The North American Pet Health Insurance Association reports 1.4 million pets are insured across the U.S.
One in three Fortune 500 companies offers Nationwide pet insurance to employees, Fell says. And nearly 6,000 U.S. companies offer it, including several in Baton Rouge and Lafayette. 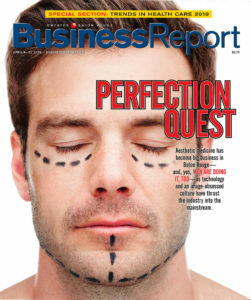 The most popular plan offers injury, illness and wellness coverage. Policies vary by cost according to coverage options and breed. The premium for a 1-year-old Labrador in Baton Rouge is $64 a month, for example, while a 1-year-old Siamese cat can be covered here for $35 a month. The growth of the pet health industry goes hand-in-hand with growth of the pet food industry, which also follows human trends. Veni Harlan, co-founder of Marsh Dog in Baton Rouge, can attest to that. Her business produces all-natural, healthy dog treats using lean Louisiana nutria meat. Marsh Dog was launched in 2012, just as consumers across the country were increasingly looking for healthier food options—and not only for themselves, but for their pets as well. With more people treating pets as family members, Harlan says, owners are willing to spend more for better quality products and services, whether it be for speciality dog food or luxury grooming services, both of which have spiked in recent years. And it’s not just the millennial generation, says Lindsay Thompson, who operates a mobile grooming spa in Baton Rouge. Older people, and especially empty-nesters, are increasingly parting with more money to pamper their pets, she says. 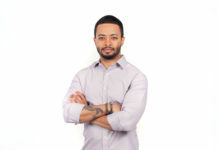 Thompson has been in the business of in-home pet sitting, dog walking and grooming for 11 years. 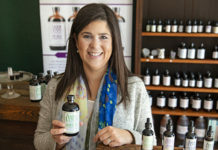 She branded her business K9 Krewe Pet Care in 2010, and in 2015 she purchased her mobile unit, where she provides grooming and de-shedding treatments. Her mobile spa is an expensive, upscale service. She only accepts clients who commit to a standing appointment schedule of every one to four weeks, and her grooming prices are higher than most, starting out at $77. extra cost for the convenience and comfort of their pet,” she says. 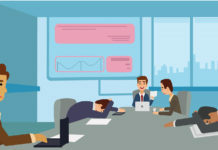 The tough part, Thompson says, isn’t finding clients—she gets calls almost every day and has 80 people on her waiting list—but keeping up with the demand.